The IEM receives a "real-time" feed of GOES East and West satellite imagery in GINI format. We process this into GIS-ready RASTERs for download and web services. This page details this dataset. 18 December 2017: The GOES "East" satellite has been assigned now to the recently launched GOES R/16 satelitte. Sadly, due to format changes and the amount of CPU processing and disk storage needed, the IEM can likely no longer process these datasets. The old GOES "East" continues to transmit until the first week or so of January. 24 November 2014: The Infrared Imagery is now color enhanced by default. The previous default grayscale was not very useful. You can find a color ramp here. The GOES (Geostationary Satellite) provide the commonly seen views of clouds from space. The IEM receives a near real-time feed of this data in GINI format and processes it into geo-referenced PNG raster files. A directory of these files can be found here, but the native grid projections may be difficult for you to use. The IEM projects this data onto a simple lat/long grid (EPSG:4326) and you can find those files here. 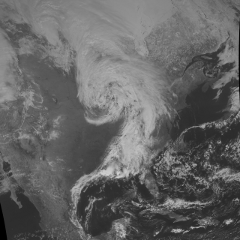 Besides the raw files, the IEM also provides OGC web-services of this imagery. The raw GINI data files are provided on predefined grids used by the National Weather Service AWIPS system. Here is an attempt to cross reference these grid numbers into Proj4 strings. 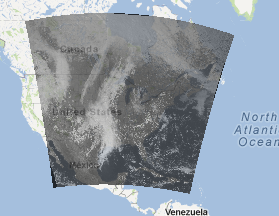 These AWIPS projection imagery files can be found here. You will find three files for each image: the raw PNG imagery, the world file, and a JSON formatted metadata file. to the URIs above. Your WMS application may require it. Since 20 Dec 2005, the IEM has archived 4km composites of East/West imagery. Since 8 March 2009, water vapor channel was added to the archive as well. Since 21 June 2011, the IEM started archiving GOES East and West vis,ir, and water vapor imagery in PNG format on the AWIPS 211 projection. Since 14 March 2012, the IEM started archiving all of the GINI processed imagery. 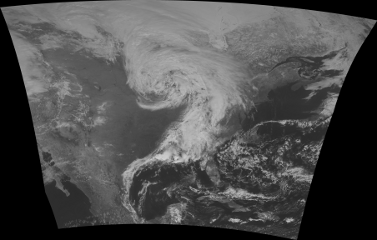 22 March 2012, removed the confusing filenames of including the GOES satellite identifier in the filename. This causes problems when the satellites change from east to west. The URL pattern contains the year, month, and day. The datafiles have timestamps in UTC. The RADAR & NWS Warnings app provides a neat web mapping interface combining radar and satellite data along with NWS warning products.